Have you ever needed to flatten a directory structure, moving all file contents from a directories child folders into a single folder? While you can do this manually by moving around files and folders from the file system of Mac OS X or Linux, a faster option is to turn to the command line. Maybe at one point you created a nested hierarchy of directories that you now need to undo by moving all files out of those nested folders and back into a single directory, or maybe you’re looking to simplify a directory structure, whatever the reason, this trick works quite well. Using the command line to accomplish flattening of files and directory structures is obviously best reserved for advanced users who are comfortable with using terminal in general, if that doesn’t describe you, consider doing it manually through Finder, or using the Mac Automator app to accomplish similar automation of file system activities. We’re focusing on directory flattening from the command line here, however. Note the subdirectories will still exist, they’ll just be empty. Make sense? If not, or if that doesn’t demonstrate what you want to accomplish, you probably don’t want to flatten a directory at all, maybe you’re looking to merge or use ditto to do a complex copy to elsewhere. Replace [DIRECTORY] with the directory of your choice to flatten, as demonstrated in the example above. Yes, the directory appears twice in the command string, the first time is the directory being searched to flatten subdirectories of, and the second time as the destination for the found items. Be precise with the specified destination, because this is not reversible (well, at least without a lot of manual work on your part), so only do this if you’re absolutely sure you want to relocate all the files in the target directories child directories back to the target root folder. After fiddling with a variety of bash and zsh alternatives, this handy trick was left by a commenter on StackExcange and it ended up being the easiest and most compatible method. If you know of a better way to flatten a nested directory, do let us know in the comments! Replace ‘;’ with ‘+’ and you’ll invoke me to move loads of files at once instead of one at a time. If you’re only renaming a handful of files it won’t make any appreciable difference, but if you’re renaming a few hundred it will. Also bear in mind that while directories with tens of thousands of files in them will give you some operational difficulties. This gets really bad if the directory is shared across the network — a simple ‘ls’ can wind up taking several minutes. -Instead just open top folder twice in 2 separate browser windows. -in one, search for ‘jpg’ or ‘.’ (this might exclude files with no extensions so it’s not perfect), select all, and then drag into the other window or new folder. also, not sure how the command line will handle items with the same name writing over each other. Using the command listed above worked, even with various extensions (and a ‘dot’ file). Excellent! Thanks eh! 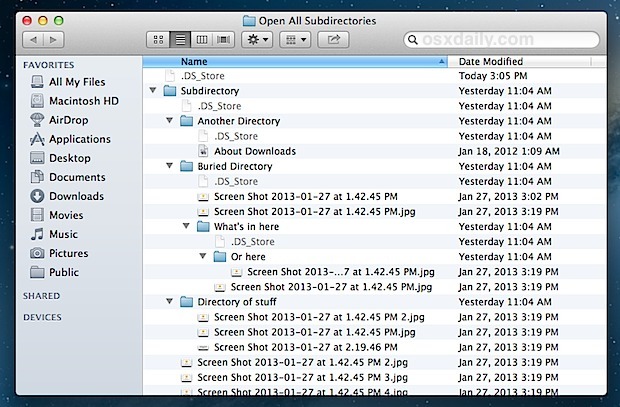 In the above, the same filename exists in 3 different subdirectories and the contents may be different in each file. Are the files skipped? or overwritten? Terminal asks you whether to owerwrite files of leave them as they are, in each subfolder. Any idea how to get a working function with this? Is it possible to move a type of file (jpeg) to the top? Nice post, just what I was looking for. But, when I do this from terminal all the .DS_Store files require a confirmation. Is there an easy way to exclude those? Thanks! Great post, anyway to make this action not ask for confirmation to overwrite duplicate files? Great, thank you very much for this post. 1. Instead of `mv -i`, use `mv –backup=numbered`. This will prevent over-writing of same name files and instead append numbers to same names as suffixes. 2. Instead of `mv -i`, use `cp –backup=numbered –link –no-dereference –preserve=all`. This merely creates a hard link to the existing files in the new directory (it doesn’t copy, even though we’re using cp). The backup option has the same non-over-writing effect as above. 3. Instead of `find [DIRECTORY] -not -path ‘*/\.DS_Store*’ -mindepth 2 -type f`, use `find [DIRECTORY] -mindepth 2 -type f`. This ignores .DS_Store files. You can also replace ‘*/\.DS_Store*’ with ‘*/\. *’ if you want to ignore all hidden files. Once we have the flattened directory, we can delete the hierarchical tree with all subdirectories within safely. If the cp command is used, this deleting is still safe as the files themselves are not removed, only the hard links. Is it possible to save the files with the names for directories included? Is there a way to do this but instead of moving… to copy? I have it all in folders on my HD but want to move them all to an SD but without the folder structure.